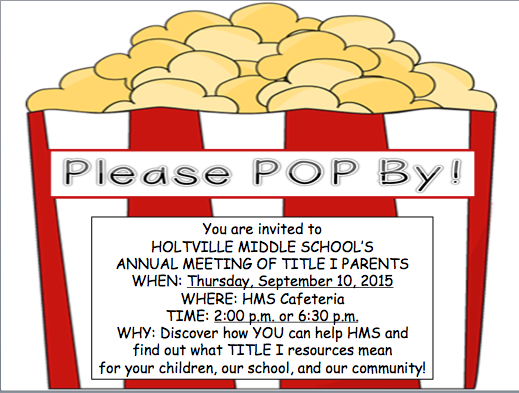 Holtville Middle School's Annual Meeting of Title I Parents is scheduled for next Thursday, September 10, 2015. This year, we are holding this meeting at two different times to try to make it easier for our parents to attend. Meetings will be held at 2 p.m. and 6:30 p.m. in the HMS cafeteria. 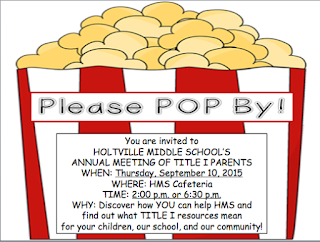 We would love for you to attend to find out about our Title I program and how you can be involved in the many activities at our school!